Roots: The Valiant is inspired by the SHIELD Helicarrier from Marvel comics. The Toclafane were originally designed as a substitute for the Daleks during a period where their appearance in the new series was in doubt. They are quite similar to the robots in the TV Comic strip The Gyros. The drumbeat is suspiciously similar to part of the Doctor Who theme tune. There are cameos from Sharon Osbourne, McFly, and Anne Widdecombe and references to the Daily Mirror. The Master watches Teletubbies and plays the song Voodoo Child. Goofs: The Doctor claims that Time Lords always know each other the moment they see each other. Which contradicts at least a dozen different stories where he's been fooled by the Master wearing a disguise. If Leo's in Brighton, then why is he walking along a cliff? The US President refers to himself as President Elect of the United States of America. A title that only applies to somebody who's won the Presidential election but hasn't actually taken office yet. A President Elect is not able to represent the US in diplomacy, and is not usually allowed onboard Airforce One. The laser screwdriver is said to age the Doctor by 100 years, which shouldn't have such a dramatic effect on the Doctor (the first Doctor was around 450, and was barely affected by the time destructor which aged Sara Kingdom to death in The Daleks' Masterplan. The Tachyon Recreation Generator in The Leisure Hive aged the fourth Doctor by five centuries, and he didn't look as aged as the Doctor does here. Continuity: Tish's full name is Letitia Jones, and Leo has a friend called Boxer. The Doctor has locked the TARDIS co-ordinates, so it's only possible to travel between the last two places it visited. The Master has turned it into a paradox machne. The Toclafane are a Gallifreyan fairytale, something like the bogeyman, which leads the Doctor to conclude that they aren't real. The Time Lords resurrected the Master because they thought he would be the perfect warrior for the time war. [There is no mention of which of his deaths this was from. It's possible that this Master is merely a copy of the original.] He was there when the Dalek Emperor took the cruciform, so he ran and hid (see Utopia). He talks about hearing drums in his head. Gallifrey was called the Shining World of the Seven Systems. The Citadel is on the Continent of Wild Endeavour, amongst the Mountains of Solace and Solitude. Gallifreyan children are taken from their families at the age of eight to enter the Academy. Novices are take for initiation, which [sometimes?] involves standing in front of the Untempered Schism – a gap in the fabric of reality, allowing you to see the whole of the vortex. This experience is implied to be a cause of the Master's madness. The Doctor turns the TARDIS keys into low-level perception filters, making it really difficult for anyone wearing them to be seen. This effect taps into the Master's Archangel network – which uses mobile phone signals to hypnotise. The UN Security Council decided first contact policy in 1968. It does not allow first contact to happen on sovereign soil, and does include provisions that can remove heads of government from office if they violate the policy. The Valiant is a flying aircraft carrier, owned and run by UNIT. Saxon helped design it. The US President is called Arthur Coleman Winters. The Master has a “laser screwdrver”, which uses a miniaturised version of Professor Lazarus's technology (The Lazarus Experiment) to prematurely age the Doctor. Mr Saxon has been very briefly mentioned in various stories. So here's a complete account of where he's been mentioned, and the backstory established in this episode. Saxon's fictional backstory includes studying at Cambridge, being a Rugby Blue, winning “the athletics thing”, writing a novel, and going into business. He became real eighteen months before this story, during the downfall of Harriet Jones (The Christmas Invasion), and first became prominent when he ordered the Racnoss to be shot down (The Runaway Bride), where his name was mentioned onscreen). Saxon was the Minister of Defence at the time. He was also the Minister responsible for launching the Archangel network, though it's not clear whether this was the same ministerial role, or a different one. Since Archangel is the way he kept himself hidden from the Doctor, it seems likely that the Archangel job came first. Saxon appears to have then formed his own political party, as his cabinet is entirely made up of politicians from other parties who defected when the polls started swinging his way. Saxon is polling at 64% in a Daily Telegraph headline in Love & Monsters. He gives the order to shoot down the ship in The Runaway Bride. Vote Saxon posters are seen in Captain Jack Harkness. Vote Saxon posters are seen in Smith and Jones. Martha's mum, Francine, is given information about the Doctor from “Harold Saxon himself” in The Lazarus Experiment. People working for Mr Saxon are seen with Francine in 42. Links: This story follows directly on from the end of Utopia. The Doctor mentions the Master's history of hypnotism (first seen in Terror of the Autons). We hear the cloister bells (first seen in Logopolis), and there is talk of the Time War, Gallifrey, and the Daleks. There are flashbacks to Aliens of London, The Christmas Invasion, Army of Ghosts/Doomsday, and The Runaway Bride. 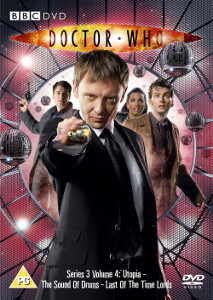 Extras: This episode had an episode of Doctor Who Confidential. Location: London and the Valiant, four days after Smith and Jones. Since it's the day after a UK General Election it's a Friday. The Bottom Line: ' The Master is Prime Minister of Great Britain. ' It's rather engaging. Some nice action set-pieces, an intriguing mystery about how the Master put himself in position, and a gripping cliffhanger. Simm's Master isn't to everyone's taste, though.